CAR TILLGÄNGLIG - vår 5 sätet är luftkonditionerade Toyota tillgängliga för uthyrning i förväg genom någon av våra gäster på en rimlig takt. Inomhus handdukar - gästerna behöver ta med strand / pool handdukar. Lovely spacious apartment with everything you need for a relaxing stay. The grounds and pool were just perfect and so peaceful but only 3 minutes walk from the beach. We are hoping to stay again one day! Amazing gardens for sunbathing and playing with a fabulous pool. We loved sitting on the decking area which was lovely and cool. Andrew was a great help around the accommodation. 2 bedroom garden apartment was really nice. Would stay again. From the moment of arrival - the lush mature garden and the welcoming items in the fridge, I knew it was going to be a special holiday. The garden apartment is spacious and light. The kitchen is very well equipped and the beds comfortable. Along with the large lounge there is a huge deck which was brilliant for eating outside enjoying the bougainvillea, watching all the wildlife including monkeys playing in the garden and beautiful humming birds, not to mention swift access to the pool which is surrounded by beautiful palms and mango trees. The beach is about 7 minutes walk away with beautiful white sand and clear blue water. Access to the fish market, shops, cafes, restaurants and other beaches is easy because the busses are so frequent. Simon and Sarah were fabulous hosts - unobtrusive but when needed, attentive to all requests and ready with recommendations for where to eat, which turtle cruise to take, where to surf etc. All in all a lovely, relaxing, special holiday - still talking about it to friends! This wasn't my first time at Mullins Bay House, and it won't be my last. One of Barbados’s hidden gems. Very comfortable and homely. Well equipped kitchen and plenty of utensils, plates and glasses. Very big pool and private grounds in tranquil setting. Great house for any occasion. Can’t recommend this property highly enough. One of Barbados's hidden gems! I stayed in Simon & Sarah’s garden apartment in December, just before Christmas. I couldn’t have had a better time; when I arrived, the fridge was stored with a couple of welcome beers from the local Banks Brewery and the bookcase had a variety of novels and non-fiction to take in by the pool, or the decking immediately outside the front door. This kept me happily occupied during the early mornings that I’d experience due to the time difference with the UK. Guides to shops, restaurants and other miscellaneous activities are conspicuously placed on the table so it’s easy to make plans. There’s a strong WiFi connection aswell, though I tried to stay away from emails and the like while in such a glorious country! I slept perfectly in a very comfortable bed - no mosquitoes made it through the windows and I could regulate temperature easily - important on humid nights! The kitchen is equipped for any kind of meal you wish to cook, and above all the Mullins Bay House staff are wonderful; both efficient and discreet yet prepared to stop to get to know the guests; a great way to engage with the local community while enjoying your holiday. Simon & Sarah have been coming to Barbados for years; they have a profound understanding of the island’s character and culture and did everything to ensure maximum satisfaction during my stay. Highly recommended! The garden is lovely and lush green with comfy sun loungers. There is a good size pool but it needs clearing of leaves - I didn't see that happen during our stay. The cottage is clean and well equipped with air con in bedrooms. The kitchen/living room doesn't have air con - and it really needs it for the evening as to keep room cool you need to leave door open which lets Mosquitos in (and there were more here than other places we visited during our stay this year). The cottage is typical old bajan style so if you want modern facilities then it's not for you. Having said all this it's in a great location for beach and is close to bus route to get around the west coast of the island. 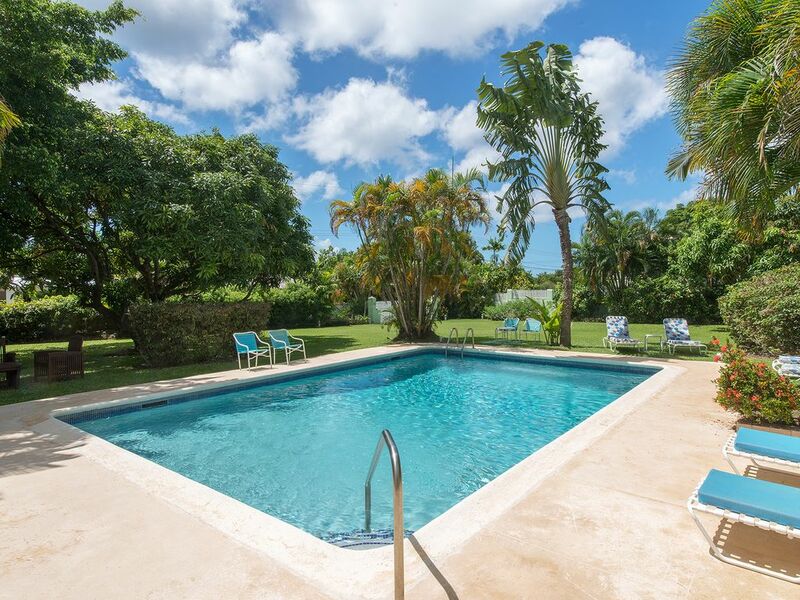 TRÄDGÅRDEN LÄGENHET & Pool lägenhet på Mullins Bay House ligger i St Peter som är lummiga och tyst med några av de bästa stränderna i Barbados. ---- Mullins Beach Restaurant är 350 meter bort och ett bra ställe för lunch över kristallvatten. Bekvämlighet shopping är 800 meter bort tillsammans med 4 andra lokala äta platser. --- Speightstown, den färgstarka och livliga andra största stad i Barbados är drygt en mil norr med ett brett utbud av butiker, banker, barer och restauranger som mango och den berömda Fishermans Pub. ---- Holetown är 5 miles söder med cirka 20 restauranger och barer, taxfree shopping och andra tjänster. --- BRIDGETOWN huvudstaden är 10 miles till söder. Andra aktiviteter: Luxury Spa bara 4 minuter promenad.